If you own the MRPH tokens, the recent exciting news will leave you delighted. 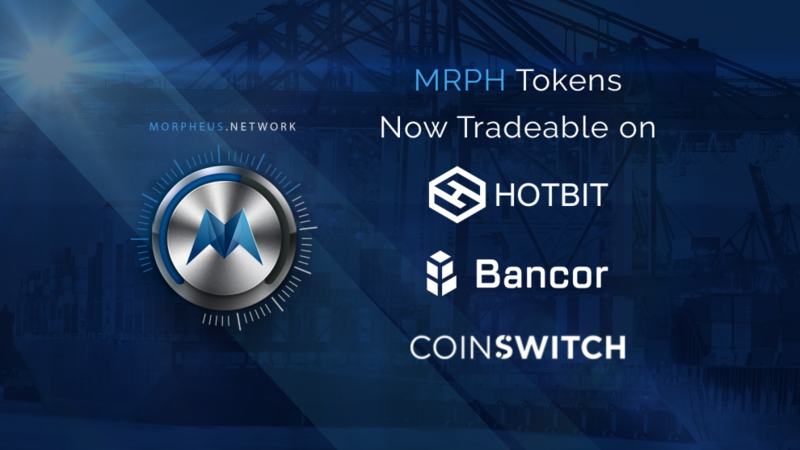 The MRPH tokens by Morpheus. The network will now be accepted on some of the big exchange platforms such as Hotbit, Coinswitch, and Bancor. These platforms are considered to be popular among the crypto owners to carry out the exchange of their digital assets seamlessly. As the MRPH Tokens will be functional on all these three exchange platforms, users will be able to trade and buy the token for ETH as well as BTC. That also means that users will also be capable of depositing and withdrawing MRPH token on the platform in a hassle-free manner. https://t.co/VDc7slHmXR features on Fox Business. Apart from being acceptable on Hotbit, Coinswitch, and Bancor, MRPH tokens also enjoy open functionality on a variety of other digital trade exchanges such as IDAX, LA Token, Switcheo, IDEX, and Livecoin. MRPH is at the center of the automation platform envisioned by Morpheus.Network. It facilitates the use of smart contracts based on Ethereum as pre-decided automated contracts, customs, and shipping documents as well as automated payments at a global level. The MRPH tokens also find its usage in digital transactions. The latest development has emerged after Morpheus.Network’s recent declaration about its airdrop for the month of January. You can register for the airdrop by filling out your details to be eligible for attaining your very own bonus tokens. In case you missed out on January airdrop, stay connected for the upcoming notifications.